Electronic Laboratory Notebook (ELN) technology has experienced significant growth in the past three years, particularly in commercial life sciences. Driven initially by demand in medicinal and process chemistry, organisations are beginning to evaluate and install ELNs in other domains, such as biology, analytical chemistry, and quality assurance. We project market growth of between 30 and 40 per cent for 2006 over 2005, with sales of approximately US$50m(i). Though small in comparison to the $450m annual sales of LIMS, its market growth rate is over four times larger, making it one of the fastest-growing segments of scientific informatics. Approximately 20 per cent of commercial life science organisations are using, implementing, or in the process of finalising an ELN purchase(i#i). This is a considerable achievement for a market sceptics gave up for dead just a few short years ago. Why has the market taken off for a technology available since the early 1990s? There are many reasons, but none more than the application of specific solutions to the day-to-day problems scientists’ experience. Early ELNs were very generic in their design, providing a secure repository to document research. Early adopters liked the ability to share ideas and to have readable and protected intellectual property. However, the majority of the scientists, being pragmatic to conservative in the adoption of computing technology, rejected these systems as not offering tangible benefits over traditional paperbound notebooks. They were often viewed as tools for management rather than for the advancement of science. If they didn’t see any benefits, they weren’t going to invest. This all changed in the past few years with the introduction of the ‘specific’ ELN. These systems have integrated tools that aid the researcher, such as searchable reaction databases, chemical synthesis planning, and integrated chemical inventory. This created demand from the market, which has fuelled interest. Some 83 per cent of organisations now have at least some interest in ELN; 43 per cent of those are seriously considering a purchase, defining requirements, or evaluating systems. Previously limited to a handful of available solutions, there is presently a base of more than thirty suppliers. Vendors who once provided only generic or ‘non-specific’ solutions are now developing specialised application modules and/or integrating with other technology to meet user needs. There are systems available for in vivo study management, formulation, procedure execution, analytical chemistry, and many other areas in addition to the widely-used ELNs for synthetic chemistry. Unfortunately, there is no accepted format for the exchange of experiment information between the various supplier products, which makes the deployment of multiple vendor solutions challenging. In R&D, concern about the legal acceptance of electronic records continues to restrain market growth, but this is fortunately in decline. Only 20 per cent of non-users feel comfortable implementing a completely electronic environment for the protection of their intellectual property. However, this is up from just 12 per cent in 2005. The majority plan to employ a hybrid approach, where final data is printed on paper for patent support. Many large pharmaceutical companies have indicated their intent to transition to entirely electronic and have already done so in a few departments. These forward-looking organisations examined the case law and determined IP is best protected using only electronic means. Up to about a year ago, the ‘electronic versus hybrid’ debate was the primary topic at ELN conferences and seminars. As companies slowly feel more confident to go paperless, ‘integration’ is now the latest buzz, as data interconnectivity and incorporation of mixed-systems environments is taking over discussions. Of potential users, 94 per cent envision integrating an ELN with other systems in the enterprise, most notably LIMS, document management, instrument data systems, data archiving, and/or scientific databases. Scientists are just as likely to define an ELN as ‘a portal into all the laboratory’s systems’ (23 per cent) as they are ‘a generic lab journal used across multiple disciplines’ (23.5 per cent). 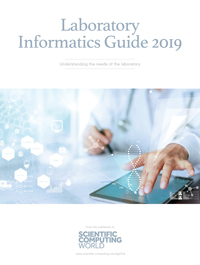 As ELNs begin to integrate structured data and workflow within the laboratory, however, the lines between traditional LIMS are blurring. Only 35 per cent of scientists are ‘clear about the difference between a LIMS and an ELN’. The major ELN providers have greatly improved their architectures and features in the past 24 months. For example, where once only very few products incorporated electronic signatures, this is now taken as a given for all. There are products built with a service-oriented architecture or with web services interfaces to loosely couple with other systems in the enterprise. Customised modules built for early customers are now being offered as standard additions to expand product capability. We expect this trend toward modularity to continue. The market for ELN is alive and well. Organisations that have implemented the technology are experiencing significant gains in laboratory efficiency and better protection of their intellectual capital. The demand from prospective users and the increase of available supplier options can now meet requirements from discovery to quality. The question isn’t any longer ‘whether’ to invest in ELN, it is now a matter of ‘when’.